There is something about dying young that perpetuates fame. Witness the icon industry that has sprung around Marilyn Monroe and James Dean. Or Meena Kumari (who passed away at 40), or Madhubala (who died at 36). 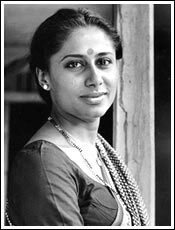 Then there is Smita Patil who passed away in 1986 at the shockingly young age of 31. The actress who was a fascinating amalgam of a steel-strong will as well as heart-tugging vulnerability, deserves the 'amazing actress' legend that has been built around her. Smita was the daughter of a minister and a social-worker mother. Born in Pune, Maharashtra, she studied at a Marathi medium school. Her first tryst with the camera was as a television newscaster. Her dusky beauty and large eyes drew attention. Always a bit of a rebel, she would grin when people complimented her on looking lovely in the saris she sported for the telecasts because minutes before going on air, she would have hurriedly wrapped the sari over her jeans. Smita shared a special relationship with the camera and, incidentally, she was very good behind the camera too: an exhibition of photographs clicked by her was held posthumously. One of the major beneficiaries of the mid-1970s efflorescence of the art movement in Hindi cinema, Smita's film career got off the ground courtesy mentor Shyam Benegal. After he cast her in the children's film Charandas Chor , and in a small role in Nishant , Smita seemed to suddenly hold a monopoly over Benegal. For a while, she even seemed to have won him away from Shabana Azmi, with whom the filmmaker had done some excellent work in Ankur and Nishant. Smita sprang to the spotlight with Benegal's Manthan , where she played a Harijan woman who spearheads a revolt at the milk co-operative. Next, Benegal cast her in a more demanding role --- Bhumika . A fictionalised biography of Indian actress Hansa Wadkar, Bhumika won Smita the National Award for Best Actress. Smita played the complex role of an actress struggling to lead her life on her own terms (through her chequered history with four men --- Amol Palekar, Anant Nag, Naseeruddin Shah and Amrish Puri) and imbued it with an insight that belied her 22 years! Smita staunchly believed in realistic cinema and accepted offers from new wave directors like Muzaffar Ali [Gaman, 1979] and Dharamraj [Chakra, 1981). For the latter, she visted jhopadpatis (slums) as part of her research and it culminated in another National Award. With Govind Nihalani she worked in the scorchingly intense Aakrosh , where she played a tribal woman who is brutally raped and murdered. She worked with Satyajit Ray in his television film Sadgati . In a bid to sate her gnawing need for good roles, Smita ventured into the regional arena too with the Marathi movie Jait Re Jait , Mrinal Sen's Bengali film Akaler Sandhaney  and Ketan Mehta's much acclaimed debut in Gujarati cinema, Bhavni Bhavai . As long as it revealed the psyche of her character, Smita was game to go the extra mile --- she did a bathing scene in the open for Chakra, some intense love-making scenes in Aakrosh and even kissed Kulbhushan Kharbanda's toes in Arth. In the early 1980s, Smita finally relented and trained her sights on commercial cinema. She won new fans with the blockbuster Namak Halal  opposite Amitabh. Their together item song and dance rain number Aaj rapat jaaye showed her in an entirely new light. Ramesh Sippy's Shakti opposite Amitabh followed in 1982. At this stage, Smita's often indiscriminate choice of films left her as bewildered as her fans. Her peripheral roles in Badle Ki Aag, Dil-e-Nadaan and Qayamat were a waste of raw stock and her rare appeal. Smita had qualms about going the whole commercial hog (lore has it that she cried after shooting Aaj rapat jaaye). She was arguably the best in the realistic films which she continued to encourage like Mandi (as the prostitute who has an incestuous relationship) and Subah (as the housewife who learns to be self-reliant). Smita was compared ad nauseum with Shabana Azmi, her senior and rival in the off-beat films' arena. So when the two were pitted opposite each other in Arth , comparisons were inevitable. Shabana had the sympathetic author-backed role but Smita's on-the-edge characterisation of a guilt-ridden mistress had its fair share of admirers, including Amitabh Bachchan and Kamal Haasan. Smita had that rare ability to stand out even in a supporting role --- witness Nihalani's Ardh Satya , the 1984 hit Aaj Ki Awaaz and J P Dutta's Ghulami . By the mid-1980s Smita was regularly paired with Rajesh Khanna --- Aakhir Kyon , Amrit  and Nazrana  --- and there was a noticeable rise in her glamour quotient. Her earlier harum scarum look segued to her picture-perfect makeup in her popular Aakhir Kyon song Dushman na kare. A series of largely-forgettable films and a much-discussed marriage with the much-married Raj Babbar was an ineluctable part of this mercurial phase of Smita's short but eventful life and career. Smita reteamed with Ketan Mehta to play the fiesty and fiery Sonbai in Mirch Masala . Smita won raves for playing a spirited masala factory worker who holds out against a lecherous zamindar. But before the pungent Mirch Masala could release, Smita shocked everyone when childbirth complications resulted in her death December 13, 1986. She passed away even before she could cement her relationship with her just born son, Prateek. Her son, now a strapping teenager, is not the only Prateek (symbol) of her memories. Smita has left behind a rich haul of films that showcase her enormous ability to offer us a glimpse into her soul each time she performed a role.